Set against a beautiful falling waterfall backdrop is the Koi Princess slot. To the side of the waterfall there is a temple and in front of that stands the very shy Koi Princess herself. The reels themselves are a plain tan colour, and there is five of them. There is also three rows and twenty fixed paylines, which means they remain active throughout. On the reels, you have four high-value theme symbols the slot game’s logo, a dragon, Chinese money and a turtle. There is also the lower value playing card symbols of 10, J, Q, K and A. If you like your oriental themed slot games, then you are just going to love the slot game. The game is by slot developers Net Entertainment, and however, unlike many of the orientally themed games out there, it is jam-packed full of bonus features. On this game, you have a bonus bet feature; several randomly generated bonuses, a wild symbol and a sizeable multi-layered bonus feature which is triggered by the bonus symbols. The wild symbol on the Koi Princess slot is the breaking wave symbol. This is one of two special symbols on the reels. The wild breaking wave symbol is special as it can help to complete winning combinations by substituting for missing symbols in combinations. While the wild wave symbol won’t substitute for the bonus dragon symbol, it can achieve its winning combinations when three or more land on a payline. 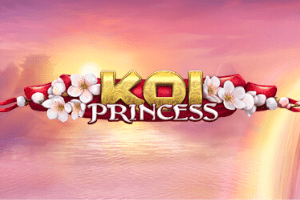 The first bonus feature on the Koi Princess mobile slot is the bonus bet function. This is an optional extra on the game which allows you to double your current bet. This, in turn, increases your chances of triggering the bonus features be it random or not. It will also increase the payouts in certain parts of the bonuses. You also have the random feature which has four elements to it. This feature, as the name suggests, is randomly triggered during any base game spin. Players will then choose one of three Koi which will award one of four bonus features. You have the 5-hit feature, which awards a free spin with a guaranteed five symbol win. You have the wild feature which awards one free spin and places up to nine extra wilds on the reels. You also have the Wild Reels feature which awards a free spin and turns reels 2 – 5 wild. Finally, you have the bonus feature which triggers the main bonus feature. Although you can trigger the main bonus feature through the random feature, it is more commonly triggered by landing three of the bonus symbols. Like the random feature, there are four elements to this, and you spin the wheel to find out which one you will play. The first two you can land will award ten free spins either with guaranteed wins or all reels completely wild. You may also land the coin win or the bonus wheel which can award a coin win or free spins. Enjoy games by NetEnt? Then play the Butterfly Staxx or the Piggy Riches slot.